Up until 1913 no American born amateur player had ever won the US Open Golf tournament. The first man to do so was Francis Quimet. Not a name many people know, but his is an amazing story of triumph over adversity. Firstly, he was relatively unknown and had turned down the chance to play due to work demands. He was convinced to take part but had to have a 'sponsor' as he was not a member of a club. He was both convinced to play and sponsored by a much older friend who had seen him play as a caddy. This was a 'bet; that was to pay dividends. After 72 holes of play Ouimet finished in a three-way tie with the two most famous golfers of the time Harry Vardon, and Ted Ray. 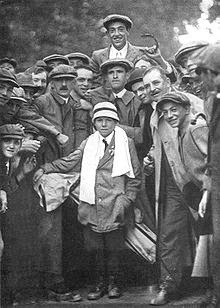 An 18-hole playoff the next day in rainy conditions, was eventually won by Ouimet. His victory was widely hailed as a stunning upset over the strongly-favored British, who were regarded as the top two golfers in the world. He was the first amateur to win the U.S. Open, and the biggest crowds ever seen in American golf followed the playoff. His achievement was front-page news across the country. Ouimet was perhaps the most significant figure in American golf and is hailed as the person who brought golf to the masses in the US. In addition to this, Ouimet had to use a caddy who was at the time 10 years old. Eddie Lowery was said to be influential in Ouimet's victory giving him advice when needed and shutting up when not. Both men went on to have significant careers. Ouimet was the first non British person to be Captain of the Royal and Ancient Golf Club of St Andrews,and Lowery became a mulit-millionaire car dealer. If you'd like to know more about this historic true life story, a very good book is available written by Mark Frost "The Greatest Game Ever Played" is a great read and also a good film. What has this go to do with design I hear you ask? Well, its more to do with business as opposed to pure design. After six years of the most biting recession since 1926 it looks like we are finally seeing growth and optimism again. For those of us still around and still able to provide clients with a good creative service these green shoots bring a ray of sunshine to an otherwise very gloomy half decade. I want to thank our loyal customers for sticking with us and I look forward to helping them and many others in the years to come. We may not become millionaires like Lowery or champions like Ouimet, but we are all lucky enough to have a chance to make our lives exciting and fun again - hopefully both in and out of the workplace. If you'd like to chat or fancy a game of golf where we can discuss your next project, why not call me on 01332 291141 for an invite?